I have 2 90 g I am trying to set up and all I have left is the plumbing. and I am not sure what plumbing pieces I have to get. 1 x 48" pc light fixture 4 bulbs 65 w each I am going to upgrade this soon. the stand is 2 x 4's doubled up with alot of metal braces and 2.5" screws it is approx 24"x 48"x 18" the average size of a 90 g.
on both tanks I will take pics later to night and add them to give all of you and idea. I am thinking that I have to modify the stand to fit the other 90 g in the bottom and to have the height required to fit the skimmer. the object I am trying to do is have the one 90 as the main display tank and then have the other 90 g as a temporary sump and have a bubble sock onit which I will clean every other day the tank will also have some cheto in it to help reduce the bubbles and nitrates. I hope this is enough info for you to help me out if yuo need some more specifics please feel free to ask and I will do my best to give that info to you. Thank you so much for your time and your info. paired clowns,SM Yellow Tang,SM 6 Line Wrasse and a Royal Gamma. With a few snails and hermits more to come soon. I can drop by sometime this week and give you a hand if you want. nice setup... I love the rimless tanks. It makes everything look soo clean. 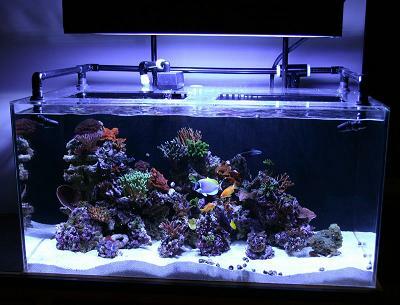 THE PICTURE ATTACHED IS COMPLIMENTS OF i2ik OF WORLDFISH FORUM HE WAS A GREAT HELP AT GETTING ME A LIST OF THE PARTS I WILL NEED. Does everybody agree that I have everything I need for the tank set up and all I have to do is modify the stand and get the plumbing parts together. here is the list of plumbing parts I need does this look like the right amount everyone. on the plumbing part, here is a list of what you need (estimation) so please excuse me if there is some parts missing lmk ok.
true union ball valce 1"
That should be ok. Hope it helps, please feel free to ask me more questions!